There are several plastic patio table styles made to look like real wood, wicker or metal. Many are so well-done that no one will know they aren't the real thing. You can take advantage of these durable alternative types of table for a great patio look. Many plastic resins are forms to resemble wood and it's often difficult to distinguish between the two. The Polywood® Nautical Rectangular Patio Dining Table can be left outside year round. It's made from 100% Polywood® lumber that's made from recycled post-consumer plastics. The manufacturer boasts that Polywood® is impervious to common weather effects. The table is unaffected sun, snow, rain, wind, sleet, chlorine, saltwater or mildew. Summer breezes won't be carrying this table off your patio. Available in black, white, green, teak, sand, and mahogany colors, you don't need to worry about fading from the summer sun. The table is treated with an additional protective Xylan coating and comes with a 20-year residential Limited Manufacturers' Warranty. Customer reviews: Customer commented, "Well built, sturdy, very stable, good size and height. Great table. Easy assembly." Purchasing the Polywood® Nautical matching chairs for a cohesive look. When selecting a table color, consider the other colors used in your patio decor. The table shouldn't stick out, instead it should blend easily with the rest of your furniture and color scheme. The Polywood® Vineyard Recycled Plastic Side Table is made from 90% recycle plastics that would have otherwise found their way into a landfill. Available in 13 neutral and bold colors. The table top boards have a small decking style spacing. Customer reviews: Several commented they'd purchased the table(s) to go with their Adirondack chairs or with Polywood® rockers. Comments included, "3rd table we have purchased for our lakeside patio", "Retains color and is very stable", and "Practically indestructible, beautiful and stays like new year after year." 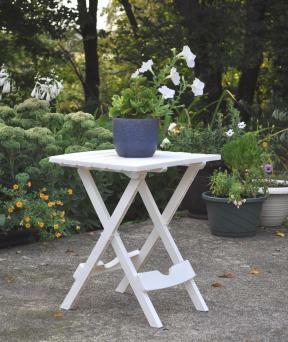 This table makes a cute drink table as a side table to a beach style chair, Adirondack chair or rocker. If your patio is colorful, then opt for a couple of the bright colors to keep the color scheme popping. This Wood Grain Folding Picnic Table is made from UV-protected, high-density polyethylene with a powder-coated steel base. 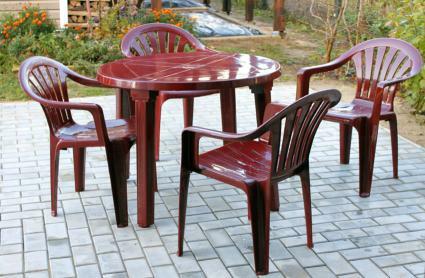 The table is resistant to rust, weather, fading, cracking, chipping and peeling. Polyethylene is more durable and stronger than wood so this table will last for years. One great feature is that the table folds completely flat; making it ideal for seasonal use since it can be stored when not being used. If you need an umbrella, there's an umbrella hole complete with a cap for those times you don't use an umbrella. The table has a 2-year limited warranty. Customer reviews: Some comments include, "Good quality table", "Love the versatility that allows it to be folded down", "Very sturdy. Looks nice on patio", "Nice looking and manufactured to last", and "So happy with it!" This is a fun picnic design for a family, especially one with children. Use it on a patio with any contemporary or modern outdoor décor. Since it folds, you can easily store it whenever you don't need it. Adams Manufacturing's Quik-Fold Side Table is an Amazon Best Seller. This table comes in 12 neutral to bright colors. Made from resin, the table is durable against the wear of weather, such as rest, peeling and rotting. Contains a UV-inhibitor. Customer reviews: A customer reminds others that the table folds in the middle, so shouldn't be moved with anything on it. However, another customer complained that it looked plastic. One customer purchased three and was quite happy with them. This table is small and can be used as a side table for setting drinks and perhaps a candle holder. Use with wood style chairs and lounges or other faux wood chairs. The look of wicker is a classic patio choice for many styles, including Southern Plantation, country, lakeside and others. Outdoor wicker is typically a poly resin that can withstand weather. 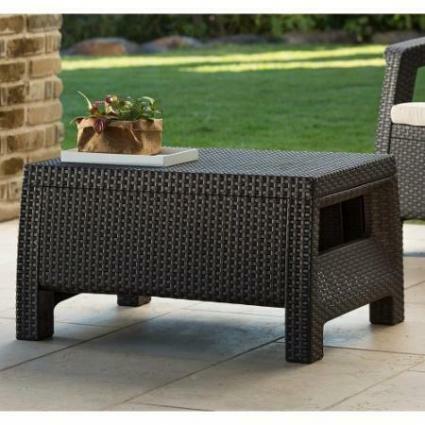 The Keter Corfu Patio Coffee Table is made from polypropylene resin that features an open weave that mimics wicker/rattan. The brown finish is realistic, weather resistant, protected against the fading damage from UV light and has a 2-year manufacturer's warranty. Customer reviews: Some comments include, "I love this table. It was a great price, easy to put together and looks, great" , "Looks good with my existing dark wicker set", and "Assembly was beyond fast. The table looks great and is strong and durable." While you certainly can use this coffee table with wicker furniture or other wicker resin furniture, it makes a great addition to other furniture styles. Add this table to a brushed bronze frame couch and chairs with ecru-colored cushions and decorative colorful pillows. The contrast between the rich dark brown and the lighter fabric will pop while the iron framed furniture will complement the darker coffee table. Add a centerpiece that picks up the other colors in decorative pillows and/or outdoor rug. The brown Coral Coast South Isle All-Weather Wicker Dining Table is made from all-weather resin. It will seat six people. The resin covers a strong steel frame and is finished in a dark brown wicker design. PVC board is used underneath the tabletop for added durability. Customer reviews: A happy customer commented that the table is, "Good Quality, Easy To Assemble, Nice Looking!" This table is ideal for a contemporary or modern patio design. You aren't limited to only using wicker chairs with this table. You may choose to add color with different colors chairs or go with a wood or metal patio style chair. The resin wicker is easy to clean, just hose off, so don't be afraid to use dinnerware directly on the table or with placemats. Add a bouquet of flowers or potted herbs as a centerpiece. Plastic molded tables created to mimic stone and tile add dimension and interest to the design. The Compamia Truva Resin Round Dining Table is available in green, white and cafe latte. The table boasts an umbrella hole that's large enough for 1.5" diameter umbrella pole. The hole cap is included. Each table leg featurez an adjustable leveler on the foot cap. It is resistant to suntan oils, chlorine, and saltwater, along with being both weather and UV resistant. Customer reviews: One customer had difficulty lining up the holes, though most are happy with the table. Some comments include, "It is easy and light to move around", "It is just the right size", and "Perfect outside table." This design will fit any contemporary or modern patio décor. Use a colorful floral umbrella featuring green, red and yellow or a green and blue geometric design. When not using the umbrella place a yellow flower pot filled with yellow and red flowers. This round Siena Dining Table by Grosfillex Commercial Resin Furniture has a design that depicts natural stone tile tabletop that tilts for easy storing. The 4-prong pedestal freatures curved base legs equipped with two adjustable levelers. Choose either charcoal or sandtone finish. Customer reviews A few reviews include, "Great quality, American made! ", "Sturdy enough to withstand high winds without toppling over", and "sturdy well-made and attractive table." Pair with wood or brushed bronze chairs. Add color with cushions, pillows and an umbrella. 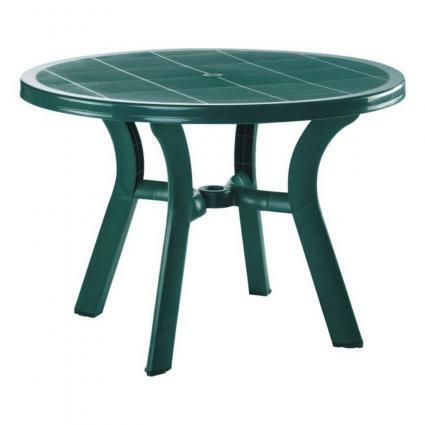 If you're looking for a durable patio table, plastic may be the ideal choice. Many plastic tables are resistant to inclement weather and come in several styles and color options.